I have a good half dozen blog posts that are in varying degrees of completion in my "draft posts" on the blog. I have been looking for inspiration to finish them up, but in this case, inspiration found me. Just a week or so ago, a reader of the blog reached out to me via Pinterest message (where I'm pinning lots of white and cream filled rooms, naturally) and asked if I was still blogging. Her last line was, "just wanted you to know I miss it!" That seemingly small gesture meant a lot to me. And prompted me to dust off the laptop, log back into the blog, and reach for all of the words again. Spare time is precious and rare these days. I know it is that way for everyone. We are all busy. We all have more than our fair share of stuff on our plates. But in the back of my mind, I knew that writing is something that I love to do, and much like running (which I am still doing), it is cathartic for me and more of a "who I am" than a "what I like to do." The post today is one I've been working on for three years. I started it in February 2016 and I have added to it, tweaked it, stepped away, come back, edited, revised, reviewed, repeat. But there was something that kept holding me back from posting it. I am glad the 2016 (and 2017 ... and 2018 ...) me was hesitant to hit the publish button. In this case, I needed a lot of time, perspective, and apparently some neighborly advice from Mr. Rogers to round this one out. This past weekend, I decided to watch "Won't You Be My Neighbor" - the documentary about Mr. Rogers' Neighborhood. As a child of the 1970s and 1980s, and I quite literally grew up with Mr. Rogers. I vividly remember waiting until after school to watch his show. I loved it all. I loved the gentleness of it compared with the fun of Sesame Street, which came on just before it. I loved the songs and the people. I loved the lessons. I loved the Neighborhood of Make-Believe. I loved his house and his sweaters and his yard. To a four-year old child in 1979 when television was really different than it is today, being with Mr. Rogers felt like I was really with Mr. Rogers, and he was talking directly to me; he felt like a member of my family. So, when I watched the documentary this weekend, I cried pretty much the entire time, and I sobbed at the end. If you have not watched it, I highly recommend it. Just prepare yourself for an emotional experience. love or the lack of it. The message stopped me right there in my tracks ... or in my cream velour track pants as it were. I stood there and stared at that bumper sticker on the back of the Prius, for what was more than a socially acceptable period of time, and cried. And then snapped a picture. This was the morning after what was, and still is, one of the ugliest encounters of my life, where I witnessed the most repugnant display of human vitriol that I had ever seen in my life. I was still reeling from that, so to see that message of love literally thrown right in front of my face was enough to be the douse of cold water in my face to rouse me from the ugliness of the night before. It is such a simple message: choose love. Choose love. Choose. Love. Period. I think the period at the end of that sentence is more than punctuation - it is an essential part of the very message itself. It is not up for debate; it is not a question; it is not a light and fluffy exclamation; it is not open-ended; it is simple and declarative: choose love. Choosing love when things are la la la good is easy - when life is full of rainbows and hearts and unicorns and smiley faces. Choosing love when things are challenging, or when you're hurting or angry, is hard. Sometimes, love yields to anger. Anger is a much easier emotion. The pull to anger is so strong and so easy and so compelling. And that morning, when I saw the bumper sticker, I was so angry. The idea of choosing love, over that anger, seemed impossible and stupid. But operating from a place of anger was not something that felt right or natural to me. It still doesn't. Which is why Mr. Rogers' quote resonated with me. Love, or the lack of it, is at the heart of everything. It is that black or white. Anger is seductive and self-perpetuating - and an utter dead end for you. You can be furious from now until kingdom come, and it won't make one bit of difference. more important areas of your life. It is so right. Anger is, ultimately, a useless and self-destructive emotion. It's unavoidable, of course. We are human. We are going to get angry. We are going to get ugly, whether we give life to those ugly thoughts or internalize them, whether we act on those ugly feelings or not. We are going to say and do horrible things that we regret. We are going to make mistakes. We are going to struggle with forgiving those who make us angry, and we are going to struggle with forgiving ourselves. This got me thinking about love and forgiveness. Forgiveness is just so tricky. On the one hand, we want to follow the adage and "forgive and forget." But do we really ever forget? And is it truly forgiveness if we don't forget? But how is forgetting possible? We can't go into the recesses of our heart and disconnect a painful memory. It would be so super nice if we could do that -- if we could say "I forgive you!" and forget what happened and never think of it again. No, life and love and forgiveness aren't that simple and don't work that way. After all, at the end of the day, when we realize we've screwed up and acknowledge it and say we are sorry, why is it so hard to give and receive forgiveness? Forgiveness requires a perfectly balanced interplay of love, compassion, and trust. Forgiveness is another way of choosing love - of putting aside the past and all of the empirical evidence before you and the pain, however acute, you are feeling and either saying to the one who hurt you: "it's ok. I forgive you. I love you", or having the conversation in the recesses of your own heart and on your own terms and quietly letting go of the anger that you felt for the person who hurt you. As for me, and that encounter three years ago, I confess that I am still wrestling with some anger. I am still grappling with those conflicting feelings of knowing that anger is useless and ultimately destructive. Still. 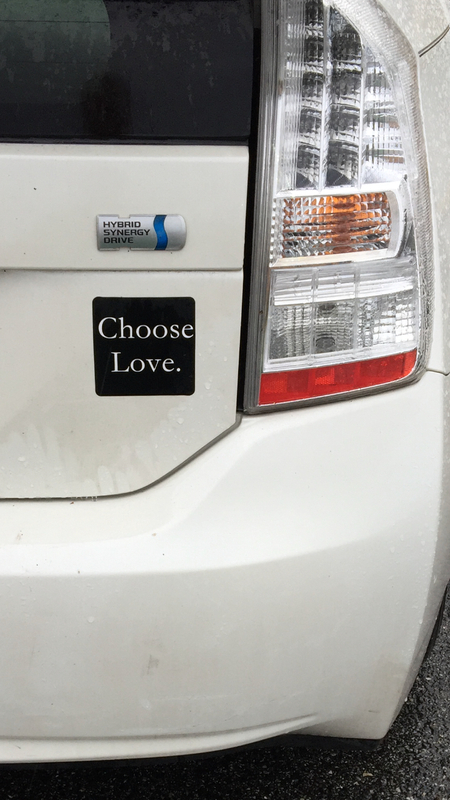 But when those angry feelings surface, I think of the wise words from the little white Prius: Choose Love. Period. of wanting to be the kind of person that others like to be with. that they are loved and capable of loving. I may not be able to stop the evil anger monster from rearing her ugly head or to readily and truly forgive someone who hurt me, but I can do this. I can show the people in my life who I love that I have chosen love (period) and that despite what you've done today or yesterday or 5 or 20 years ago, it is ok: I love you, and you are loved. * The book is Stepcoupling: Creating and Sustaining a Strong Marriage in Today's Blended Family, by Susan Wisdom & Jennifer Green. It is a fantastic resource for anyone in a blended family, step-parent, subsequent marriage. I re-read sections of it often.